Glenwood had a physical game back after the holiday break against a determined Kirkham Grammar school from the UK. From the beginning they showed their intent with accurate and strong driving ball and strong forward play from the tackle area. The Glenwood defence was strong and great offensive hits were made by the boys. Lock Kobus Viljoen scored the only two tries in the first half with long range runs from inside his own half, avoiding tackles as he out-sprinted the opposition backs to score a great set of tries. Warren Potgieter converted one try to take the half-time score to 12-0 to Glenwood. Initially in the second half, the Glenwood team was more structured and this brought the first try by flank Wandile Mazibuko and converted by Warren Potgieter. Kirkham put together another strong drive inside the Glenwood 22m area and was rewarded with a try from the drive. They failed to convert and the score was 19-5 to Glenwood. The UK touring team resorted to a kicking game and the loose kicks were punished by nice strong running by the Glenwood backs leading to a wonderful individual effort by winger Derwent Stopforth as he ran a kick back from his own half to score untouched under the poles. Potgieter added the extra two and the score moved to 26-5. Rupert Kay crossed the try line next but the last pass was judged as going forward. 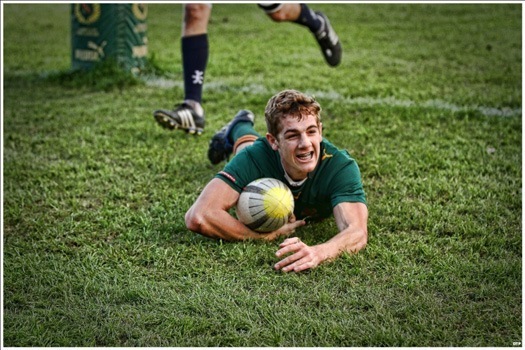 Glenwood regained possession and quick hands from Warren Potgieter eventually put Rupert Kay over and under the poles for a great try to end the game. Glenwood won 33-5.